Logitech Squeezebox Radio review | What Hi-Fi? WIN A LOGITECH SQUEEZEBOX + FREE QUEEN ALBUM! We're huge fans of the liberating qualities of internet radio – there's something wonderfully appealing about indulging in, say, Jamaican reggae being broadcast live by a real Jamaican radio station. However, too many network radios fall into the trap of being overly complicated, so picking your way through to the music of your choice becomes a chore. But not Logitech's new Squeezebox Radio. This is the first internet-only design we'd class as a serious rival to same-priced DAB alternatives. It combines a bright, full-colour 2.4in screen – able to display album art, photos and more – with simple rotary controls to deliver a class-leading user experience straight out of the box. There's built-in 802.11g wi-fi plus a wired Ethernet connection, and you can even install a rechargeable battery pack (price TBA) if you wish. To get up and running, simply plonk your Squeezebox Radio down on the table, fire it up and, assuming you've got a wireless internet network at home, you can be listening to music from all over the world in minutes. Six simple preset buttons to either side of the screen can memorise your favourite stations, while the menu structure on the display itself is both easy to use and attractive to look at. True, there's no remote control included as standard – one is available as a cost-option – but in context, that's no great chore: this is a small radio, not a room-filling hi-fi system, so tweaking the volume knob is no great hardship. The Logitech's a flexible little thing, too. It's PC and Mac friendly, and supports all key music formats, including MP3, WMA, WAV, AAC, FLAC and Apple Lossless, so assuming you've got a wireless network at home, you could soon be using your humble kitchen radio to wirelessly stream your music. Or, if you prefer, you can choose from a range of online music services, such as Deezer, Last.fm and Napster. It even supports Facebook and Flickr – share your musical discoveries, view your photos and more. Oh yes, and there's also a 3.5mm line-in for your iPod. So it's brilliant to use and live with, hugely flexible and great value – only one question remains: how does it sound? Well, it's a mono model, and the bass on offer could be a little more taut, but it's all perfectly listenable and at least as enjoyable as the same content played on the Pure Evoke Flow. 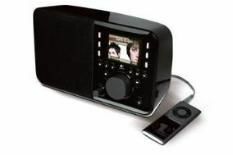 Given the Squeezebox Radio's usability, that has to make it a brilliant buy.